Peru. Mountain Reserve. Organic Arabica. 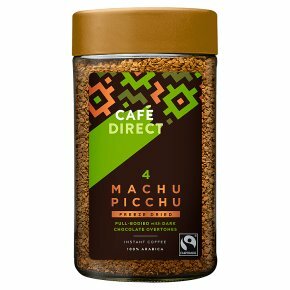 Machu Picchu fine Arabica coffee is grown at high altitude deep in Peruvian Andes, giving you a richer, smoother tasting coffee with overtones of fine, dark chocolate. Fairtrade. Freeze dried. Ridiculously good coffee. Full-bodied with dark chocolate overtones. 100% arabica.Grown at high altitudes within the Inca heartland of the Peruvian Andes, this coffee is rich and full-bodied with dark chocolate overtones. Preparation: Add 1 or 2 teaspoons of coffee per cup and add hot water.